I am here with the Waiting for Winter Mitt-along prize winners! I have asked a few of my favorites if they would donate a prize or two for our knitalong participants who finished a pair of mittens during the month of December basically. I got a great response and I can't wait to share these fantastic prizes with you. Thank you to everyone for contributing. I want to thank everyone for participating during this busy time of year. We had 200 pairs of mittens and fingerless mitts knit from the Waiting for Winter Mitten pattern! This successful amount of knitting is tremendous and somewhat surprising because the knitalong ran from December 5th to January 5th. This is perhaps the busiest time of year for most with the holidays, family demands and travel. Regardless, you all came through and each of you whipped up a pair of mittens or two, or three or even four pairs. What a fantastic and impressive feat. Click here to see the finished mittens! The variety and amount of mittens is amazing. Click here for the Waiting for Winter Mitten and Fingerless Mitts pattern! Click here for my Ravelry group, Itty-Bitty Knits! Come and join us. Everyone is welcome here. There is so much fun stuff going on all of the time, swaps, knitalongs, charity knitting, constant chatter and friendship, help, and general camaraderie. It is a fun group of generous knitters. I have randomly selected prize winners from the finished mitten thread on the Itty-Bitty Knits group. I have eight fantastic prizes to share. All of the winners need to private message me on Ravelry at susanbanderson with their mailing address to pass on to the donators. All of the generous prize donators are sending out the goodies directly to the winners. Let's get on with the prizes and winners. The winner of the Luv Bug Bags mitten motif bag is ptrosper (rav id)! Congratulations and ptrosper please pm me on rav with your mailing address and include which prize you won. 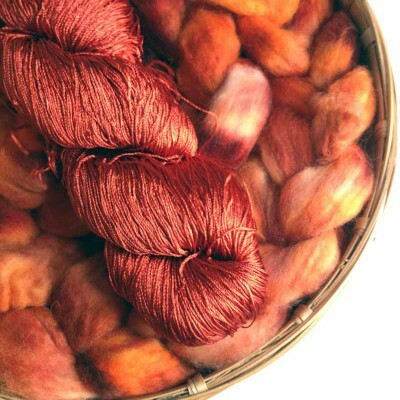 One of my favorite Wisconsin yarn creators is always Jeanette of Sun Valley Fibers (click here for the Sun Valley website). Jeanette is always so fun and willing to jump in and participate. I love that. Her yarn is simply gorgeous and luxurious. 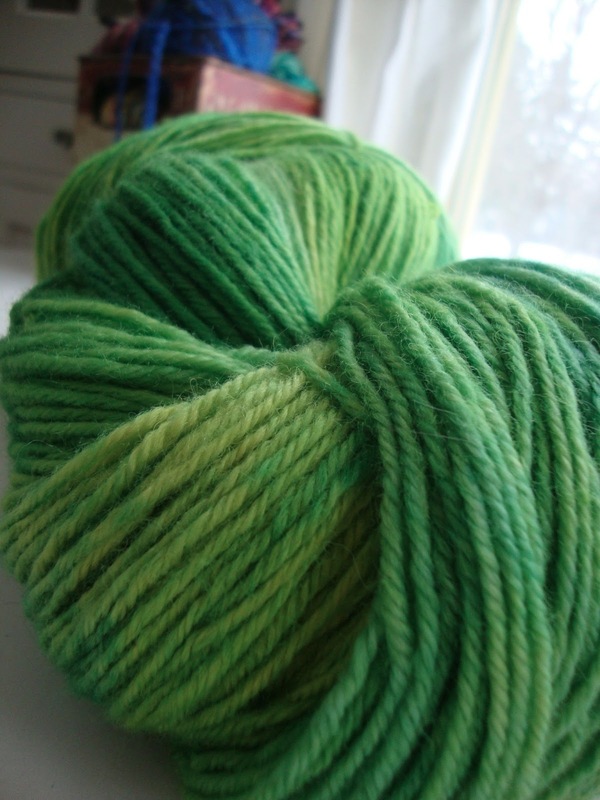 Jeanette donated a skein of her Merino Cashmere Worsted in the Topiary colorway, 220 yards. 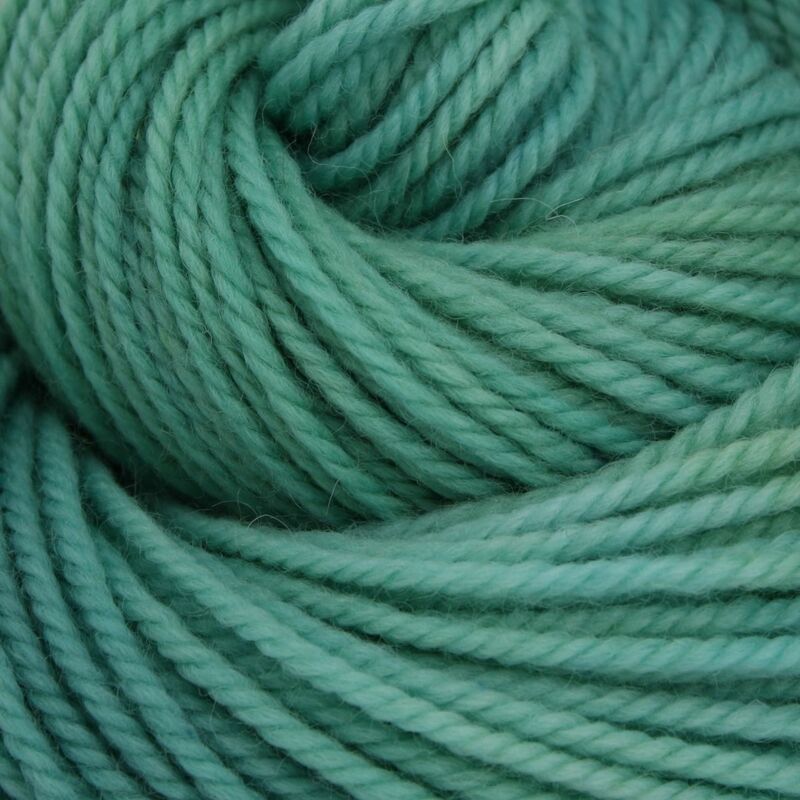 I bet this is one squishy skein of yarn to hold and the greens that Jeanette dyes up are always the best. Linnetknits (rav id)!! Congratulations Linnetknits and please pm me on rav with your mailing address and include which prize you won. Now I saw that there were many mittens knit up in another of my favorites, Cakewalk Yarns. These mittens are beautiful and fun to look at. Cakewalk Yarns has wonderful sock yarn but also squishy fun worsted weight yarns. The speckled yarns offered by Cakewalk Yarns are some of the prettiest and most unique yarns out there. Click here for the Cakewalk Yarns etsy shop! She is on a short break but will be back very soon. Rose, the talented force behind Cakewalk Yarns, has donated a skein of her 100% Superwash Merino worsted in one of the best colorways ever invented called Chalkboard. You get a generous 100 gram/215 yard skein. monkeybuttbabies (rav id)! Congratulations monkeybuttbabies and please pm me on rav and give me your mailing address and include the prize you won. I've known Kate of Knits in Class Fiber Studio for quite awhile now. She is a talented knitter and indie dyer from Minnesota. 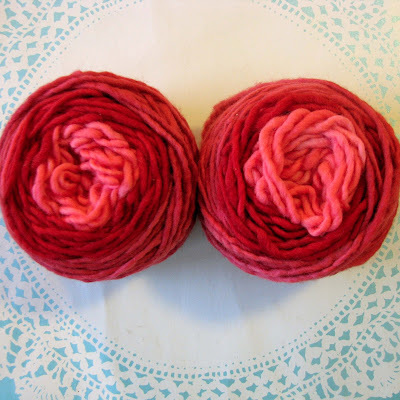 Click here for the Knits in Class Fiber Studio shop! 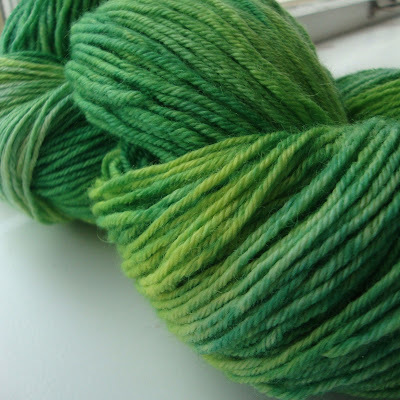 I'd like to offer up one of my new spring colors (in the photos above), Greener Pastures, in BFL DK, which is a bright and fresh springtime green. 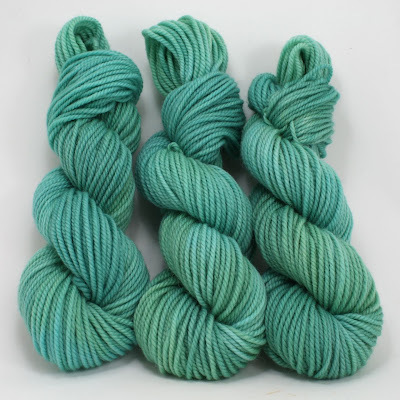 The skein is 8 ounces, 500 yards, of 100% BFL wool yarn. I recommend anywhere from a US needle 4-7, for a gauge of 5-6 stitches per inch. This DK is heavy enough to substitute for a light worsted yarn in many patterns. The yarn is kettle dyed using Greener Shades dyes. boxermama (rav id)! Congratulations boxermama and please pm me on rav with your mailing address and include the prize you won in the message. Next up, we have a crazy good prize from my buddy Jaala (pronounced Joll-a) Spiro of Knitcircus magazine and now Knitcircus Yarns fame. Jaala has a clever and beautiful offering specifically for you mitten knitters, her self-striping Malabrigo base worsted weight Twin Skeins. You knit a mitten with each skein and you have matching striped mittens! I want some of this soooo bad! I'm super excited about this unique prize and I can't wait to see someone knit up some mittens with this clever yarn. If you don't win you can still get some for yourself. Click here to see a different colorway Jaala created in the Knitcircus Yarns shop. And coming soon from Knitcircus Yarns are Twin Skeins of self-striping sock yarn done in two separate skeins. Yes to that. Click here for the Knitcircus Yarns shop on Etsy! I have something special for your knitters; my new skeins made just for mittens, Knitcircus Malabrigo Twin Skeins in the color Ruby. Each one is 105 yards, with colors moving from hot pink to deep red to mulberry. Melissa-Jane (rav id)! Congratulations Melissa-Jane and please pm me on rav with your mailing address and include the prize you won. When I think of Luna Grey yarns, I think of the prettiest, most soothing colors around. Jackie, the talented dyer and owner of Luna Grey Fiber Arts, makes wonderful and interesting colors come to life through her yarns. Click here for the Luna Grey Fiber Arts shop! 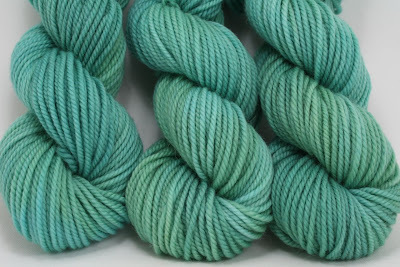 Shades of pale aqua and soft green hand-dyed onto my "Spectra" base yarn. A soft, lofty 100% Peruvian Highland wool. Knits up quickly and wears beautifully. All yarn is hand-dyed in small batches in my smoke-free studio. As with all hand dyed yarn, expect subtle color variations between skeins. Dyes are colorfast and should not run or fade. JaneBG1923! Congratulations JaneBG1923 and please pm me on rav with your mailing address and include the prize you won. Now I have a spectacular prize and offer from another one of my favorite people and yarn companies, Infinite Twist. Click here for the Infinite Twist shop and website! Please take time to read about this unusual company and be sure to check out that beautiful handcrafted spinning wheel I am longing to own one day. I am excited to be working on a super fun project with Infinite Twist in the near future. I'll keep you posted. to spin up and ship the fiber if the winner wants yarn. So you can either have the fiber in the colorway of your choice sent to you immediately or if you prefer, Cate will spin up the yarn for you! That's so cool. I can't believe this generous offer. If you choose to have the yarn spun up for you, it will take at least 4 weeks to receive your prize. It will be worth the wait. Debbie4 (rav id)! Congratulations (I can't wait to see what you pick out) Debbie4 and please pm me on rav with your mailing address and include the prize you won. 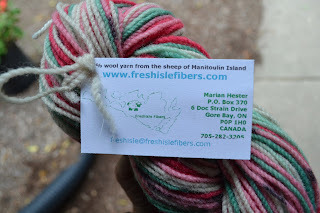 Last but not least, the one and only Marian of the incredibly hard to get and popular Freshisle Fibers yarns contacted me after she saw my own Waiting for Winter Mittens knit in her Suffolk Wool self-striping watermelon yarn. 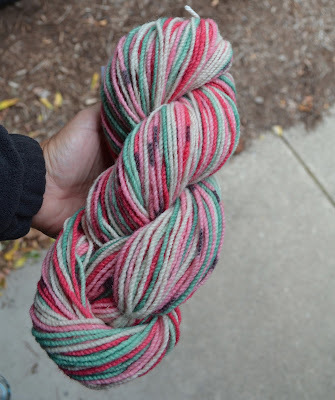 She has donated a skein of her fun and whimsical watermelon striping yarn, including the seeds, to one of you! 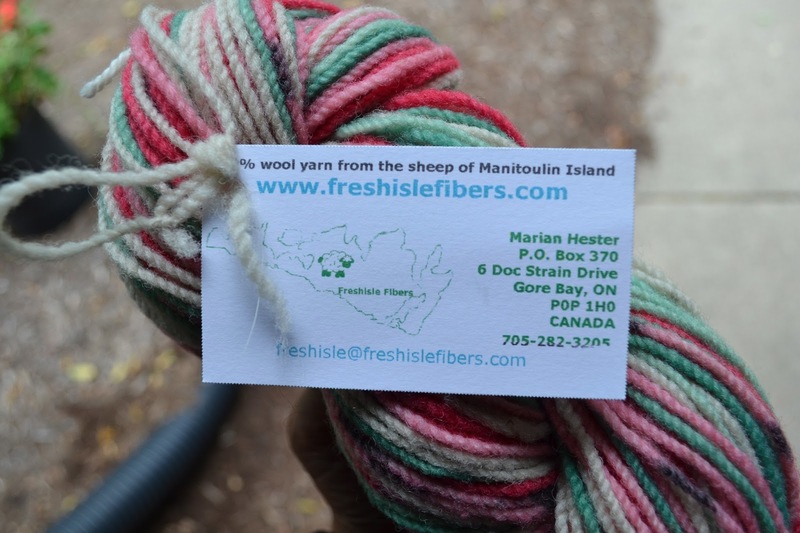 I can't tell you how lucky the winner is to score a skein of this elusive yarn. You have to be on your internet toes to get your hands on Marian's watermelon sock or worsted weight yarn. This is a true treat. I would not have even thought of asking Marian for her yarn so I was incredibly happy that she offered. Click here for the Freshisle Fibers website! Check out all of their offerings and read about the interesting company. Approximately 120 grams, 4+ ounces, 200+ yards, 2 ply worsted weight. KnittingBlitz (rav id)! Congratulations to KnittingBlitz and please pm me on rav to give me your mailing address and include the prize you won. Phew! That was a long post but all good fun. Congratulations to the winners and a huge gigantic hug and thank you to the prize donators. You make these knitalongs so much more exciting. I appreciate all of the effort by everyone. Up next, the Opal Sock Yarn Bunny and Bunny Hat patterns will become available in my Ravelry Pattern Shop! Congratulations, winners! What gorgeous prizes - I'm loving the self-striping sets. You can unofficially count in 12 more pair of mittens knit in December using your "waiting for winter" pattern! All but one pair were full mittens, with one being the shorter version. I really enjoyed the knitting. The pattern was so easily memorized I never had to take it with me after the 2nd pair. I neglected to take pictures and most mittens are already given away. But I just thought you'd like to know that you, once again, were my inspiration for some serious project deadlines! Thank you, Susie! wonderful, sara! thanks for telling me and i am glad you liked the pattern.